Today i filled my day with some modeling. I have been working on a few wagons. Well first the BBV I've been working on this for 3 years! 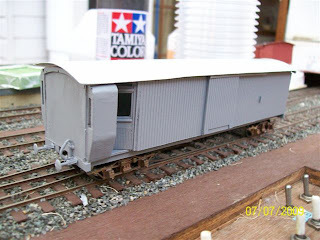 I got it to the painting stage but an oversight when reading the instructions led to the side steps getting in the way of the bogie when going around corners. So i removed the white metal ones that came with the kit and proceeded to look for a why to replace them with a suitable replacements. I got pieces of "H" section that if i remove the bottom webbing and reduce the size of the top on the same side i have a passable replacement. This was one of my purchases from this year's Brisbane model train show. I have the carriage to about 75% mark. with a little bit of filling and sanding to do. Today I completed painting the interior. Well It has been floating around the work bench for 2 years and i once had it in running condition. The body was relatively okay but it on end had been broken off. The floor and White metal bogies bore most of the brunt. The floor was cracked up the middle from bogie screw hole to bogie screw hole! the white metal bogies were super glued together and the the Spring and break Shoes broke off on both bogies. after a few choice words and self anger I proceeded to Strip the paint to repair the body. The Tank Wagons I have all the bits for but im not touching that till i get my Passenger car and guards vans done. In other News, my parents (mother) have decided that the will let my father and build a shed for our trains next to the new patio and extension to our house. at first I thought it was a joke because I have been nagging them to let me build a shed or modify the garage for our trains for years. but it is legit and I will be cooking up track plans and designs of the shed in the remainder of the school holidays (one week left). Mean while Thursday nights continue to be B18¼ work nights and so far i have a working mechanism and and tender. I started the front head stock and cab last and they are nearing completion. as far i have the mechanism modification nearing completion and the boiler turning complete so waiting for every thing to come together so more later. That enough for this rant. Well I'm slowly getting there but i did some work on the tender of my current project. this is the first loco I'm using Sprung Buffers. Here just a photo of what i accomplished tonight. Well in my travels (AMRA S scale group meeting) I was informed that the Bachmann OO Scale 45xx had the same Wheel base as the QR PB15 in Sn3½. So i bought a Prairie and i finally plucked up the guts to pull this fine model apart. The model came apart okay. Well because the PB15 is a 4-6-0 I wont need the Pony trucks. 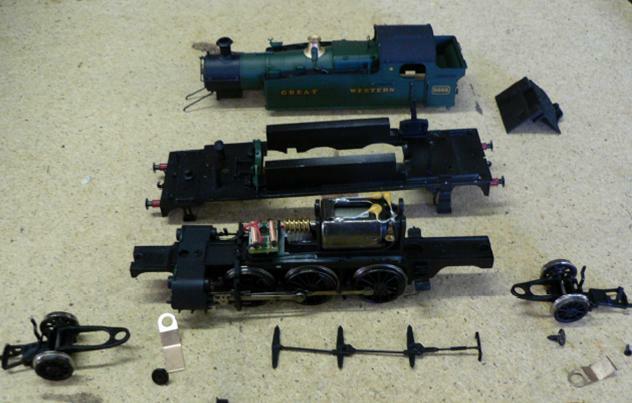 Also the body and cylinders a no longer needed so I discarded them. What i did today is shorten the chassis and file down the cylinder mount because the new cylinders will be longer than the old cylinders. Well after a long period I thought it might be time to have an update. Well things are going along nicely with my modelling and the S scale QLD group. With the BMTS 2011 around the corner for those of you who live in the South east QLD come down and support a AMRA Qld Inc. with you attendance. On another matter I was given the pleasure of my first effort of scratch building at the top of the Flyer. And with that done since the photo was taken I have repainted the loco and rebuilt the mechanism so it is now a decent loco. Ok a bit more about myself. I had my start in trains in late 2006 when I found my father’s old Life like train set. I say trains because I am also involved with many Railway related organisations i.e. AMRA QLD inc., QPSR, QLD Diesel Loco Preservation Group as well a QLD S Scale Group. After joining AMRA in early 2007 my Father and I attended a number of meetings and running days. But on the club calendar I saw "S Scale group meeting" this intrigued me. On that Sunday morning I convinced my father to join me at the club we met most of the group. Two men took me under their wings Ken Edge-Williams and Steve Malone. Ken first started to teach me (and my father) the skills of scratch building in styrene. At the end of many meeting with Ken I eventually had a body of a QR DH class. On the way home from the meeting dad had to avoid an oncoming car and he swerved. My box of goodies (including my DH) got squished between a heavy box and the car door. I was horrified to find the mangled remains of my loco. When I informed Ken of the tragedy, Ken said "Oh well we can start again" I still haven started my DH 2.0. In early 2008, I started to Scratch Build a QGR C19 (the one on the flyer). My first Attempt at scratch building in brass was great way to build patience. After many months I had fashioned (with loads of help from Steve) a QGR C19. It was a far cry from the QGR C17 Brass kits of Southern Cross Narrow Gauge Models. These locos were great in accuracy and running qualities. But I am proud of it even after 3 rebuild and 2 repaints. 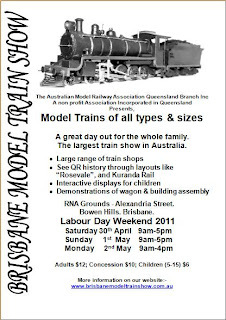 So next week will be helping set up for the Brisbane Model Train Show 2011. Hope to buy some great Goodies and Models next weekend. So till then Happy Easter. Let me introduce my self, My name is Tyler. I'm a proud Queenslander and Train buff. 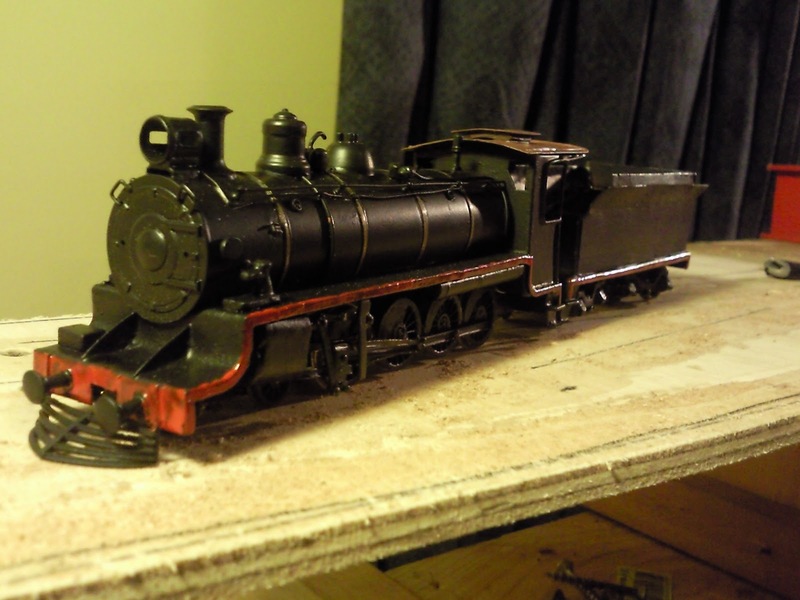 I've put up this blog to just promote modeling Queensland Railways in Sn3½. I've been modeling for nearly 4 years. in this time I've scratch built 2 locos and 6 wagons, and many kits. Sn3½ is the traditional scale of modeling 3'6" In QLD and WA and NZ with traces of a few groups in around Australia modeling the local prototype. My models aren't so detailed that you can count every rivet for rivet but i like to get the look and feel of the real thing. I use Kadees and RP25-110 wheels. I will add some photos of my models in another post.